Lori Manns has a heart for children and wants to help influence their health and fitness habits from a young age. It is her hope that these children will have a better chance of developing healthy habits once they grow up. Personally, she did not have any sort of healthy role model growing up and professed that she was ‘just a kid that played outdoors’ from sun up to sun down. The Live Healthy & Thrive Youth Foundation non-profit agency is the result of her careful planning and hard work. Its mission is to educate, activate, motivate and empower youth in the areas of health, fitness, nutrition, and total wellness. The two main programs are Lori’s ‘brain-childs’ that she created in order to activate kids towards better health. Her goal was to engage with them and make a true impact. First, the Healthy Kids Workshop and Summer Camp program brings health professions in front of children. The kids get to see doctors, nurses, dentists, and nutritionists up close and can ask questions. They get to see how these types of professional persons live their lives. In lower income neighborhoods, kids see poor people, homeless people, gun violence, and all kinds of crime. For many kids, the only professional they can really interact with on a daily basis is their school teacher. “Rarely do they see that person who is successful and professional and who has a career that is not in music or in athletics. With our Healthy Kids Workshop and Summer Camp, they get to actually see these professionals up close and personal. They get to ask them questions and learn from them.” This program is taken to schools and Boys and Girls Clubs in the Atlanta Metropolitan Area. 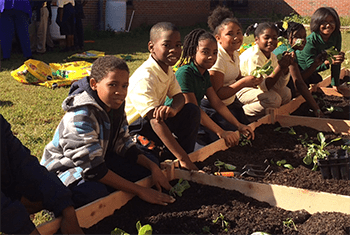 The second main program from Live Healthy and Thrive Youth Foundation is ‘Gardens are for Kids.’ This program is structured around teaching kids the importance of healthy food and helping them to learn the origins of food. 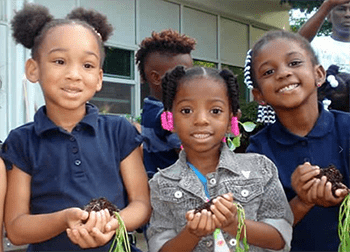 Gardens are for Kids gives children a lifelong interactive learning experience. They plant the vegetables and then wait 6-10 weeks for harvest. Children feel a sense of accomplishment and interactive learning that can’t be bought. Gardens are for Kids has been featured on many of the local TV stations. Kroger Food Stores have also been instrumental in supporting the program. LHTYF has many things to be proud of for their organization, but Lori is especially proud of their Pinnacle Youth Scholarship Fund. It supports high school students who are planning to major in education, medicine, or STEM disciplines. “We want to educate and empower them.” She explained that these are the youth who are going to be the leaders of tomorrow. 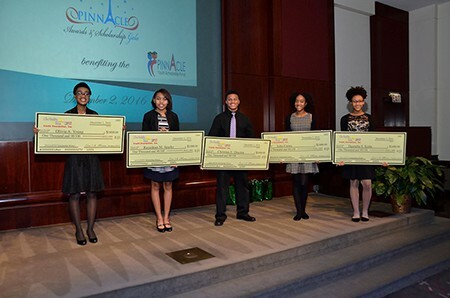 When the program started, they were only able to distribute three $500 scholarships. This past year, they were able to give an impressive five $1000 scholarships. This money will be valuable to kids who need to pay for expensive text books or buy laptops to help them during their studies. The children have thrived after going through the programs offered by LHTYF. “One of our kids is now in nursing school!” Lori explained how much these success stories mean to her and the staff. She is always happy to hear back from grown kids who say how much of an impact the programs have had on their lives. If you would like to help LHTYF meet their goals. Please contact them using the information below.